Any changes you make to your home obviously need to be done with the value of your home in mind. When you’re talking about a security system, it’s more than the feeling of security it gives your family. It also comes down to the discounts you receive on your renters or homeowner’s insurance, and the equity of your home with the bank. In fact, you may want to talk to your insurance provider to see if they recommend a certain security system or provider for you. Of course, a security system is only good if it’s actually monitoring. Simply having the cameras in place is not going to do anything but deter crime. Rather, there must be a recording system to prove who or what is responsible if a claim ever needs to be filed. You have a few choices for this, including your own DVR system or hiring a monitoring agency. Some of these companies monitor for fires and water damage as well, beyond the chance of a break-in. The cameras that you put up should also be versatile in terms of being weatherproof and able to detect motion. Their range should be noted on the box they came in, as far as how well they see at night and what kind of motion range they receive. Usually, you should try to get cameras that view at least 50’ away, especially at night. That will give you a good range of recording in case something does go wrong or your property is vandalized or damaged. 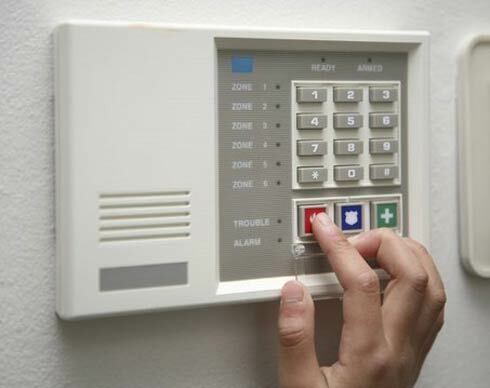 Securing a security system is easier than ever now that so many providers are operating. You should be able to find a price plan within your current budget and perhaps get the cameras installed for free. Once you’ve found a reliable company to work with, this will be another tool you can use for peace of mind. The longer you have cameras up, the more well known they will be in your neighborhood. When the crime level goes down around your house, it will also affect the value of your property. By making this kind of investment into a security system, you are making a wise real estate decision at the same time. « Does Bad Credit Haunt Your Homeowner Dreams?